Did you know that alligators can’t be walked on leashes? Within minutes of joining a drum circle, it is a relief to discover that, instead of musical notes, this internal chant is a drumming pattern. Even if you are rhythmically challenged, you immediately feel included and relaxed and create a powerful sound that is not only fun but good for your health. So, what is a Drum Circle? A drum circle is a group of people coming together for recreational music-making using hand drums and percussion instruments. The focus is not on performance but on personal or group development and wellness or just plain fun. Simply put, bang on a drum; it’s good for you. Philip Thomas demonstrates his drumming skills. 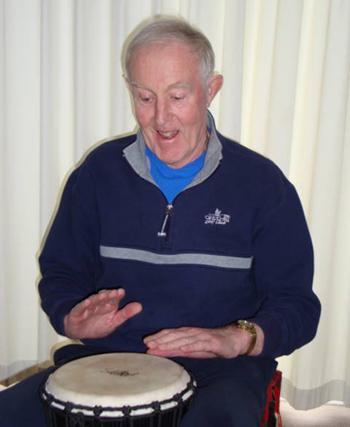 For more on the health benefits of drumming, see Michael Drake’s complete article, Drum Therapy – Therapeutic Effects of Drumming.